Some members of our field staff come to InFaith knowing how and where they are called to serve, while others respond to ministry opportunities discovered and publicized by the mission. InFaith field staff members have a passion for God and a willingness to adapt ministry methods to address the specific needs of the people God leads them to serve. Take the first step in joining us by filling out our initial questionnaire. We know that researching an organization to join can be overwhelming, so we thought we'd list out some of the benefits you receive by serving on InFaith's field staff. How short can long-term be? That's a great question! We don't have any hard and fast rules about this. But we do think the time and energy investment in the application and fundraising process warrants at least a 3-year commitment to your ministry with InFaith. Depends on a lot of factors, but we think you should plan on three months after the initial conversation with our expansion coach. Do I have to travel to the Home Office to apply? Nope. All conversations and interviews take place on the phone or over video conferencing. This varies tremendously among our candidates. Factors include: the relative wealth (or poverty) of your network, the amount of time you put into fundraising, and the amount you are needing to fundraise. Except under rare circumstances, you should plan on a year, even two, to reach your fundraising target. What am I raising funds for? You are fundraising for the cost of your ministry program. This includes your personal salary, the associated taxes, health insurance (full-time), ministry expenses, and administration. What does it mean to "join" InFaith? 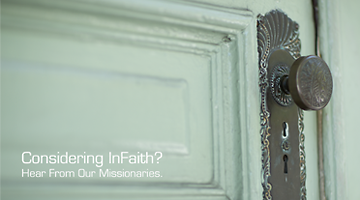 Joining InFaith means to become an employee of InFaith. Your relationship with InFaith is similar to that of any other employer. The unique thing about InFaith is that almost everyone brings to us his or her own job description. What if I already have an existing ministry with a name, logo, website, or brand? Everyone who joins InFaith must adopt the InFaith name and brand. This is what allows you to raise support through tax-deductible contributions with InFaith and keeps us in compliance with IRS standards. This means that any existing ministry name, logo, website, email address, colors and fonts that you use to communicate about your ministry will have to be changed to clearly communicate that you are now a part of InFaith. But don't worry; we'll walk you through it. 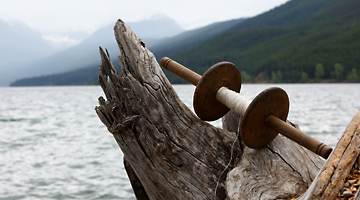 What training does InFaith provide? We have an orientation training that focuses primarily on fundraising. We help you articulate your ministry's mission, use the tools that InFaith offers, and know the best practices in deputized fundraising today. We also encourage continuing education of all our field staff through our Ministry Education & Training (MET) program. Take the first step and fill out our Initial Questionnaire.